The bulk of the info and walkthroughs currently on the net about Bluetooth and Linux were written, basically, in the stone age. You know, back in the days where you had to ./configure and make install your own pile of stones to stand on so you could see above the grass to accurately aim small files at your tribemates. What I really could’ve benefited from when I was doing this was a dead simple explanation of how Bluetooth is meant to be used and what apps there were for doing it using a plain Ubuntu install. So, here one is. Enjoy. The mobile phone does what you think it does. Anyremote gives you a way to control a PC with a mobile phone or PDA via Bluetooth, IR or a plain cable. Read about it, it’s cool. 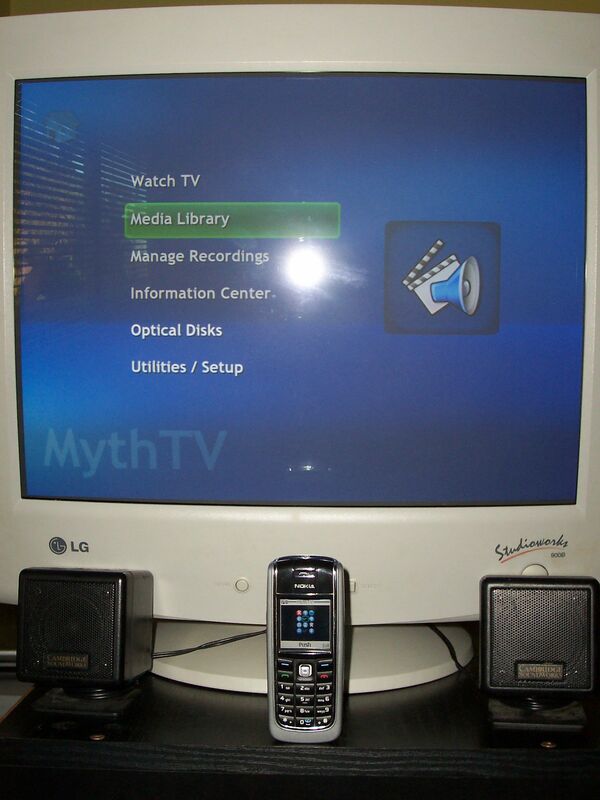 In setting up a MythTV box (more on it later), I was a bit stuck for how to control the thing – eventually I’ll dig an IR receiver out of somewhere, and train it to use a DVD remote control or something, but until then I had a USB keyboard with a very short cable. Or until I actually made practical use of my phone’s Bluetooth capabilities and made a remote control out of that instead. Besides, controlling your computer with your mobile phone is really really cool. Viewing a Windows network file share on Ubuntu is easy enough. In the Places menu, click Network, then Windows Network, then the computer you want to look in, and so on and so forth. Only programs that use GNOME’s virtual file system framework (gnome-vfs) will be able to directly open files over the network like this – Gedit, Totem Movie Player, Evince (PDF viewer) etc (incidentally, gnome-vfs does more than samba; you can also treat things like remote FTP and SFTP/SCP folders this way). Things like VLC, Firefox etc can only see files on the local filesystem, so network shares have to be mounted locally for them. This is done using smbfs.